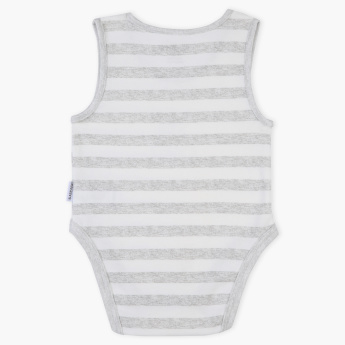 Pep up your little baby for a warm day out with the help of this striped bodysuit. Featuring a bear on the front, the sleeveless piece is the perfect choice to dress your darling in for all-day comfort. Features : Pure cotton made sleeveless bodysuit with snaps closure for easy dressing and easy diaper changes.